May is the time for a pair of special events with Laura Albert in California’s Bay Area. 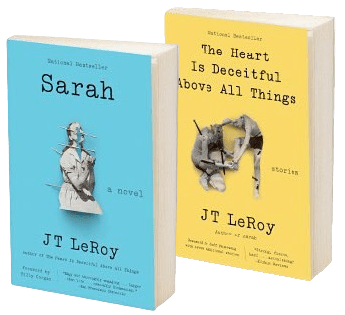 On Tuesday May 16 at 7 PM, there will be a special screening of Author: The JT LeRoy Story at The Battery in San Francisco — and Laura will be there for a Q&A with artist Dorka Keehn. You can read more about the event here. Just across the bay, a few days later on Sunday May 21, Laura will be participating in the Oakland Book Festival at Oakland’s City Hall. She’ll be speaking with artist, educator, and writer Seumas Raibéart Coutts from 3:30 to 4:30 PM in the Council Chambers. All the latest details are available here. There’s plenty of good literary fun to be had for all – including this talk by The Rumpus about how to create real change in the literary community. Watch this space for further updates as the last details are finalized. And please come join us!